A cerebral spirit, Lady Midday. Known as Pscipolnitsa, she is a mythical woman in white who roams the farm fields of most of Eastern Europe. She takes on various forms ranging from an old hag, a beautiful woman, or a 12-year old girl. Unlike most spectral woman, who often seduce or appear lost, Lady Midday engages in conversation or asks difficult questions with her would-be victims in the hot afternoon sun. Should the victim steer away from the conversation or answer incorrectly, she slays them with either shears or scythe, or places an illness on them. In some countries, Lady Midday is used as a type of boogey woman to make children behave or else they will be abducted by Lady Midday , never to be seen again. My depiction of Lady Midday draws her in a long flowing dress, with tassels that move with a life of their and like my previous entry; the Kuchisake-Onna, she manifests weapons out of her own blood. 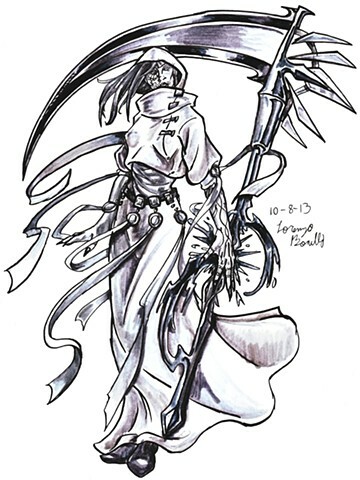 The scythe I went the anime route in giving her a decorative scythe with the bladed ends faintly resembling a sun, while using Day of the Dead inspired markings for her face and arm to indicate her accessing her abilities.